Daly City, California, Nov. 28. Willie Ritchie, of San Francisco, became the lightweight champion, of the world by defeating Ad Wolgast this afternoon, at the Daly City open air arena, referee Jim Griffin awarding him the decision in the sixteenth round. Wolgast had fouled him twice. 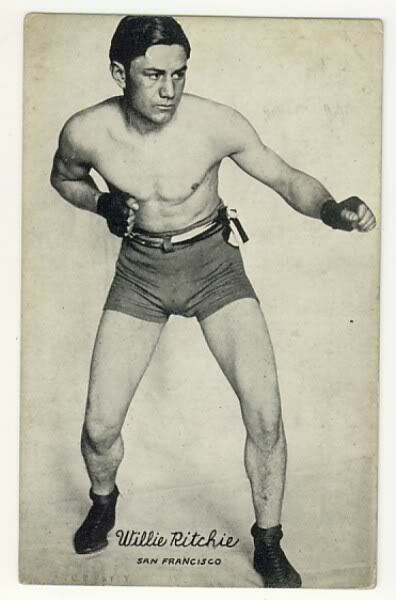 Wobbling on leaden legs, his eyes glazed and his body reeling, Ad Wolgast, conqueror of "Battling" Nelson, fouled Willie Ritchie twice in the sixteenth round of their fight at Daly City today. With the wave of Referee Jim Griffin's hand, which disqualified him, the lightweight championship of the world passed for the first time in Queensbury history intothe keeping of a California boy. By his ring generalship, his courage and his splendid fighting ability, Ritchie won his spurs in the championship division. Through round after round, toe to toe milling, he earned clear title to the pugilistic crown he wears, with his waspish left to the face and his stinging right cross. The unexpected end of the fight came after those at the ringside noticed, in the fifteenth round, that Wolgast's strength was waning a mite. The boys faced each other in the sixteenth, Ritchie confidently carrying the milling to the new serious champion, from whose face the sneering smile had passed. As Wolgast was going away, Ritchie made him wince with a two handed volley to the mid-section, and then, quick as the wink of an eye, a crushing right shot out and caught the Cadillac fighter fairly on the jaw- He fell back on the ropes and sagged, pitching forward in another instant in his corner. Ritchie crowded him and as he raised his head the San Franciscan repeated the right cross. Ritchie, true to his agreement, had skipped, across to the opposite side of the ring when his opponent went to the canvass. As Wolgast came at him, he rushed to meet him, and the two exchanged: blows. Griffin rushed between the fighters, pushed Wolgast aside and raised Ritchie's hand in token of victory. the crowd at the ringside cheered him and hundreds rushed to shake hands when he left the ring. Ritchie was taken to a bath house and Wolgast went to his ocean beach training .quarters immediately after the fight. Wolgast had the better of several of the rounds, four were even and the remainder were easily Ritchie's. In the first two the local lad outboxed the champion in the fourth, and in the tenth, which was really the turning point of the . fight, he stood shoulder to shoulder with him. Wolgast said he did not intentionally foul Ritchie, and that he thinks it's a poor wav to win a championship. The new lightweight, known to the world as Willie Ritchie, is plain Gary Steffen to his neighbors. When fifteen years old he Began boxing along with being a chauffeur. His first bid for the limelight was a year ago today when he substituted for the stricken Ad Wolgast in Los Angeles and boxed twenty rounds with Freddie Welsh. Since then he all but won in ten rounds from Joe Mandot in New Orleans, and last May he boxed four rattling rounds with Wolgast. flooring the champion twice. Since that time lie has been counting the moment when he could get back into the ring again. He is 21 years old and of German parentage. Ritchie, with the men fighting close, scored several times to the head and the face before the champion essayed the offensive. They mixed fiercely in a neutral corner, and the Californian scored the first blood as a result of a succession of short arm blows to the mouth. Wolgast spat blood as he took his seat. It was Ritchie's round. Wolgast opened the round with a rush. The champion kept well under cover and after deluging Ritchie with several left and right to the jaw. drove two wicked rights to the jaw and a left upper cut over the heart . Ritchie broke ground .and Wolgast drove two telling lefts to the stomach. The round ended with desperate in-fighting, Ritchie excelling. Wolgast's round by a shade. Wolgast drove in a powerful left to the stomach. His blows lacked direction, which provoked comment. Wolgast drove two wicked rights to the stomach and a right to the mouth which started the blood. Wolgast almost sent his man through the ropes -with a right to the jaw. Ritchie fought back fiercely. The bell ended the round with both bleeding from the mouth. .Round even. They came up eagerly, and exchanged right upper cuts to jaw. Ritchie drove the champion against the ropes with snappy blows to the face. The "Wild Cat" stood in his own corner and covered up. Ritchie's round. A rally to the ropes and clever blocking by both men brought cheers. Wolgast sent right and left to the jaw. A right cross almost sent Ritchie to his haunches. The champion followed this with a right that all but closed the Californian's right eye. Decidedly Wolgast's round . Wolgast took no chances with the shifty Californian. He kept at a safe distance. Two lefts reached Ritchie's damaged eye. At close range the champion hammered away at the body, landing once in the pit of the stomach with great force. Ritchie's hitting- power was deficient The champion, took his corner grinning. Wolgast's round. Wolgast rushed in and planted right to the jaw Ritchie. winced. Wolgast began to talk to Ritchie. The champion whipped several punches to the jaw and all cut floored the Californian. Ritchie appeared groggy. Wolgasts' round. Ritchie came up with a sick smile and the champion sent in short range blows to the face. Wolgast's defense was perfect. Ritchie's blows failed to reach him. Wolgast landed on body and jaw and scampered to his corner. Wolgast's round. Ritchie's right eye was closed. The champion rushed and chased his man about the ring. He showered rights and lefts to the stomach Ritchie wincing under the blows. The wonder was that Ritchie weathered the storm. Ritchie landed a hard right swing to the face at the bell. Wolgast's round. They fought close together, with Wolgast doing considerable execution. He used short arm blows to the body. Ritchie showed surprising vim, and tilted the champion's head with straight left and right. Wolgast here lost his poise and Ritchie hammered him unceasingly with right and left swings to the jaw. The crowd was on its feet. Wolgast went to his corner looking worried. Ritchie's round. His best showing of the fight so far. Ritchie carried the battle to the champion. A vicious rally followed in mid-ring. Wolgast swung wild. Ritchie landed straight right and left to the jaw. Ritchie was growing stronger, planting solid rights and lefts to the face. Wolgast swung wildly again. Ritchie's round; the champion was slowing up. Wolgast chopped his right to the eye and left to the stomach. Ritchie sent back straight rights to the face. He rushed Wolgast about the ring, and drove his right to the stomach. Wolgast landed a hard left on the point of the chin without effect. Round even. Fighting head to head they exchanged face blows. Each did little damage. Wolgast appeared wild. Both seemed strong and willing to force the pace. Wolgast rushed Ritchie to the ropes just as the bell ended the round. Round even. Both men swung wildly. Wogast sent Ritchie to the ropes with two good rights to the stomach, and a left over the closed eye. Ritchie countered with light rights to the body. Wolgast sent Ritchie’s head back with a left to the nose, and almost closed Ritchie's good eye with a hard right. Wolgast's round by a shade. Ritchie was able to see from one eye only as he came up. He sent a wicked left to Wolgast's stomach and they fought at close range. The referee pried them apart several times. Ritchie landed a volley of lefts to the stomach and out-boxed the champ. Wolgast closed the round with a hard drive to the stomach. Wolgast had been given a taste of whiskey during each round intermission. Ritchie swung a right to the jaw as they met and Wolgast tottered to the ropes. Ritchie sent the champion to the floor with a right swing. Wolgast came up reeling again. Ritchie's right shot out and Wolgast was sent against the ropes. Ritchie, however, lacked power to put in a finishing blow. The best Wolgast could do was to close in, stalling all the while, his eyes glazed. With the men locked, Wolgast brought his left up and struck Ritchie low, the crowd yelled in protest. Referee E. Griffin, grasped "Wolgast saying,,. "do that again and I'll disqualify you." He had scarcely finished when Wolgast duplicated the punch again, catching Ritchie below the belt. Griffin stopped the fight and promptly awarded the decision to Ritchie. Wolgast received $15,000 previously guaranteed as his end of the purse. Ritchie's portion was $6,339, or 50 per cent of the $27,078 gate money, after the deduction of Wolgasfs share. Willie Ritchie never stopped so many blows and never missed so many of his own swings in any fight in his career as he did last night when Marty Farrell of New York made good the predictions that he would prove too clever a man for the former lightweight champion. About all that Ritchie had left after Referee Eddie Hanlon had raised Farreir’s hand and had shoved Ritchie aside, was a weight alibi about which he will probably be crying for the next month or more. It seems that Ritchie and Farrell agreed to make 150 pounds at 8 o'clock last night. Ritchie has a holler coming—Farrell did not make the weight. Because of the lax system of making weight agreements binding, there was not enough at stake to make Farrell feel that he need worry about not making weight. But whatever sympathy Ritchie deserved through Farrell's failure to make weight was lost when Ritchie and his followers tried to cover up his own weight. In the ring before the battle, Farrell's weight was announced as 157 ½ pounds. Jack Kearns was on hand and insisted that Farrell weighed only 156 ½ and his statement met no denial Ritchie's weight was announced by the official club announcer as 147 pounds As a matter of fact the testimony of more than one person who saw Ritchie on scales is to the effect that Ritchie weighed 150 pounds Stories were going the rounds of a piece of gum and a half dollar that properly manipulated might have kept Farrell within the weight limit. Ordinarily this story would have been enough to throw the spotlight of suspicion on Farrell,, but with Ritchie's camp so intent on taking three pounds oft his weight for some mysterious reason, Ritchie was the one who was the object of fandom s suspicion before the battle was under way. Ritchie started like a flash and shot in rights and lefts to the head in bunches of three and four to start the first round. But Farrell hit his stride in the middle of the round and evened the honors for the round with lefts to the head and a flock of rights to the stomach in the clinches Ritchie's only round was the second, and that was by the merest shade. He landed right swings and left jabs Farrell began to show what later developed to be his big weakness — he has no right hand except for short pokes in the clinches If Farrell were a two-handed fighter, the fans would not be wondering why they had never heard much of him. But In the third and fourth rounds, Farrell cut loose and although he did not use much more than a straight left, he Jabbed enough of these into Ritchie's face to have Willie's nose a mass of blood and to have Willie staggering around swinging wild and trying In vain to keep in close long enough to hang on. Still Farrell failed to use his right, and still his left did enough work to make , Ritchie's followers begin to talk of the possibilities of a draw. When it was all over Ritchie edged up close to Farrell and showed that he would have been willing to take a draw. Referee Eddie Hanlon raised Farrell's arm and Ritchie shoved his up alongside. But Hanlon shoved Ritchie's arm down and Ritchie had nothing to say. The only protest heard was a. faint one from some of the old see-in-the-hole boys who tried to make themselves believe that it should have been a draw. New York, Oct. 27.—Johnny Dundee beat Willie Ritchie the former lightweight champion of the world, in their bout at Madison Square Garden and beat him through all but about two of ten hot rounds. The queer hop toad tactics of the little Italian seemed to completely befuddle the one-time title holder. Willie was more of a welterweight than a lightweight on the scales, having nearly ten pounds advantage over Dundee and he was more of a second rater than a champion in the ring. A fast and clean boxer at his best, there were moments when he seemed painfully slow before the weird squatting, hopping; bouncing attack of the Italian. In the eighth the Californian appeared to finally be getting unlimbered and he caught Dundee on the tip of the jaw with a right hand lick that knocked Johnny to the ropes, following this a second later with another slashing right that staggered Dundee. In the ninth he unveiled a beautiful right cross, catching Dundee fair on the jaw, but the Italian proved that there is no glass in his facial structure by shaking off the punch and then winning the round. Ritchie was cautioned for holding by Bill Brown in the fourth. In the fifth the fighters fall in a heap when Johnny almost hurdled Ritchie in a wild rush. Once Willie slipped and fell on the wet canvas, the rain falling through the open skylight and dampening the surroundings. Through the earlier stages of the fight Ritchie fought in a dazed manner and let Dundee swarm all over him. But in the concluding rounds he was fighting In something like the form that once made him champion. He had no chance to catch up however. Dundee tried to make every round a winning round and won too far away foe any argument. There was a row over the matter of weights although the men had agreed to box at catch weights. However there is a boxing commission rule that prohibits one man from weighing ten pounds more than the other. Monteith brought up this rule and after Ritchie had entered the ring the chairman of the commission took him back to the weighing room. He tipped the beam at 141 ¼ pounds with just his shoes on. Dundee who had also entered the ring went back and showed that he weighed 132 ½ pounds. Johnny Dundee defeated Willie Ritchie in their ten round bout last night. According to my figures Dundee had the advantage in four rounds, three were even and the rest go to Ritchie. It was a hard slashing fight, and Dundee deserves credit for his showing when you consider he was forced to give away about nine pounds. Dundee did the only thing possible by being on the offensive most of the time, for that was the only way he could overcome the handicap. Ritchie put up his usual aggressive fight, but he couldn't keep up with his light-footed rival. In the ninth round it looked gloomy for Dundee. Ritchie landed hard rights to Dundee's heart. Willie landed a few hard rights and at the finish Johnny appeared to me to be rather tired. The weight and steady bearing of Ritchie appeared to tire the little Italian. The last round was a thriller arid both boys worked hard enough to get the crowd to its feet. It is hard thing for a man like Ritchie to fight a fast boy like Dundee, so you've got to give Ritchie credit just the same. It was terribly disappointing that more persons didn't turn out to see this good fight. As far as I am concerned I'm still willing to fight either Dundee or Ritchie if satisfactory arrangements can be made. Of course, one of the stipulations must be that the fight is conducted under the lightweight scale. Friends of Willie Ritchie, champion, and Johnny Dundee, the Italian fighter, disagree over the outcome of their ten-round bout last night Each side claimed their man had the advantage. Dundee had all the better of the early rounds. His fast work puzzled Ritchie, and it was not until the last few rounds that Ritchie got the Italian's measure and gave him a severe lacing, evening- up what advantage the New Yorker had earlier in the bout. Willie Ritchie the Californian boxer who formally held the lightweight championship but who was trained down fine to make 141 pounds, last night fought a draw of ten rounds with "Johnny" .Dundee, the local contender for the title. Dundee weighed only a little more than 132 pounds and was a true lightweight. If Ritchie had weighed two pounds more than he did there would have been no contest, for the rules of the commission will not permit two contenders in the smaller classes to meet when there is a difference of ten ponds between them. Willie Ritchie of California is lightweight champion of America today only because decisions are not allowed in this State. he met Johnny Dundee of this city in a ten round bout at Madison Square Garden last night and came out second best after a bout, which sizzled with action in every round, Had the battle been of greater duration Ritchie might have won, for during the last three rounds he easily swept Dundee before him. But the conflict was for only ten rounds, and in perhaps six of these the local lad showed superiority. Johnny Dundee a legitimate lightweight of this city, out boxed Willie Ritchie in their ten-round bout at Madison Square garden last night. Ritchie, a California boy used to be lightweight champion of the world before he lost a decision in twenty rounds to Freddie Welsh, the Briton. Ritchie never will be lightweight champion again —not unless he loses a leg or a couple of arms. He is a welterweight and cannot get away from It. Ritchie last night weighed 141 ¼ pounds, with his shoe Dundee 132 ½ in the same equipment. By the grace of the Boxing commission Willie Ritchie of California ,still is the lightweight champion of America. It was a fortunate thing for him that the commission would not permit Referee Bill Brown to give a decision. Had permission been granted Ritchie would have lost his title for Johnny Dundee of New York gave him the trouncing of his life in a ten-round bout at Madison Square garden last night. Dundee had a clear advantage of seven rounds, Ritchie pained the honors in the eighth and split the popular decision in the other two chapters. Dundee was Ritchie;s master at all styles of fighting. Willie Ritchie, the American lightweight champion, had to extend himself to the limit to get a draw in a speedy, slashing ten-round bout with Johnny Dundee at Madison Square Garden last night. The bounding Italian's fast work early in the bout puzzled the champion, and he missed repeatedly. It wasn't until the last few rounds that Ritchie got Dundee's measure, and then he gave him a severe lacing. The eighth round was a whirlwind and while Dundee was dancing rapidly around his opponent Ritchie clipped him with a right on the jaw, which took the little Italian off his feet and shot him against the ropes. Ritchie drove Dundee around the ring under his fierce attack, and when on the other aide of the ring he again hit him on the jaw and partially knocked him off his feet. In one of those old-fashioned, give-and-take, cockle-of the heart-warming scraps such as father used to see in the old bare-knuckle days, Johnny Dundee shaded Willie Ritchie, the former world's champion lightweight, in Madison Square garden last night. Ritchie was defeated, but not disgraced, and showed himself to be every inch a champion. Scotty Montieth's Scotch Wop only was better geared for ten rounds—that was all. All the credit to the dank-skinned flashing son of Italy, however, for his victory on points, for the raging, fighting little scion of the Caesars gave away eight and three-quarter pounds to the former lightweight king of the squared circle, and emerged with a victory which, though as slim as the hair from off the beard of the prophet, was clear and pronounced. What the result would have been in a longer bout is a matter of conjecture. Last nights battle was a ten round affair, and in It Willie Ritchie had to play second fiddle.